To save data from the open-source CMS effectively, try the shareware program taking away all of backup jobs from you. Using FTP, SFTP or FTPS protocols, Handy Backup will secure website with Concrete5 backup much better than any hand-made or built-in tool! Using the dedicated plug-ins, you can save both static Concrete5 data via the FTP, SFTP or FTPS plug-in and dynamic data from a Concrete5 database via an appropriate SQL-related plug-in, all in a single task. The program can save all these data in a "hot" mode, allowing staying online for your website! You can schedule your Concrete5 backup task to start at an exact time, and then to repeat running with an exactly defined interval, from one minute to some months. You can also start your task by system events, run missed tasks after scheduled time, and call other programs before or after a task. 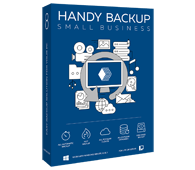 Handy Backup provides a lot of storage types for Concrete5 website backup, including local drives, external USB disks, NAS, FTP and cloud storages such as S3 cloud services, Google Drive and WebDAV-based clouds. You can encrypt and compress data just from a task. Note: Instructions in this video suggest that you already have Handy Backup installed on your computer. To start website backup quickly, please follow the instruction to save your Concrete5 database content. 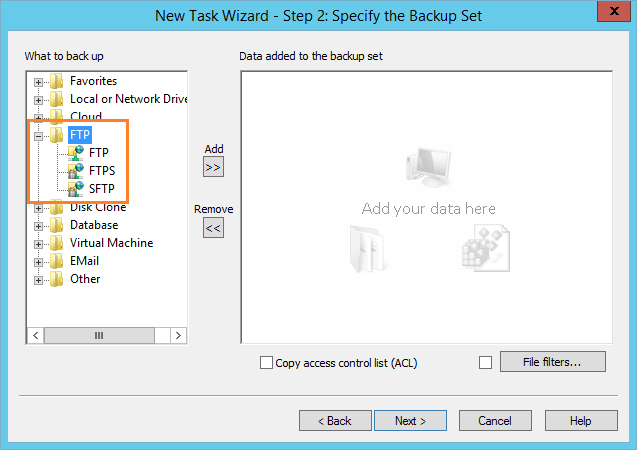 Create a new task and ,select the backup task, type. Go to the Step 2. On the Step 2, select the FTP, SFTP or FTPS plug-in from the "FTP" group. Click to add it. Click twice onto the "Create a connection…" string. 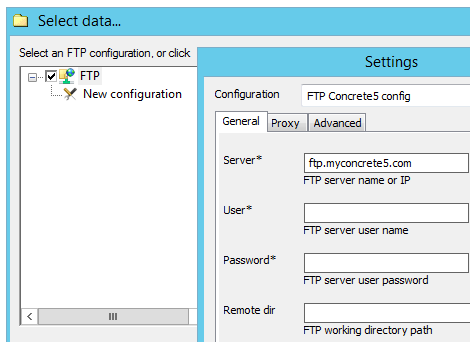 Set up a configuration of your Concrete5 website FTP in the next dialog, then click OK.
Click twice onto the connection name. Mark the checkboxes before any content you plan to back up. Click OK. Return to the Step 2 window and select an appropriate Concrete5 database backup plug-in from the "Database" group. Again, click to add it. Create a connection to a database by providing all necessary data, then select data to backup Concrete5. You can learn much more about website backup and task parameters by reading the User Manual. To save all data and settings of Concrete5 CMS, you need to use the Handy Backup Small Server edition. Free 30-days trial version! As the demonstration of power and simplicity of Handy Backup, we will shortly describe some other methods of Concrete5 automatic backup. Being the "traditional" ways to save website copies of this CMS, all these methods require much efforts and have some flaws spoiling usage. Concrete5 Dashboard Backup feature. The built-in Concrete5 tool for data saving can keep only website structure and some static text, i.e., no database backup, no uploaded files backup and no any other backup option. This method is also designed firstly for small websites. PHPMyAdmin. Utility for governing website content, PHPMyAdmin lacks any automation of backup functions. In addition, it allows changing database settings and content, so be careful when you try to perform your Concrete5 database backup! Scripts and batches. It is a need to be a true pro to program or even use some Concrete5 backup script without problems. Scripts are also lack visualization of the backup and restoration process, therefore using the scripts requiring the extended manual control over all parameters. If you still have any doubt, please download the latest, fully equipped trial version of Handy Backup and try Concrete5 backup freely at 30-day period! You will have no regrets about this experience!